An introduction to Lean Canvas, and how it’s different to a business plan. What’s this Lean Canvas exercise all about exactly? A lean UX canvas is a popular workshop tool created by UX consultant Jeff Gothelf, and serves as a step-by-step guide to both understand the current landscape of business and customer needs, and acts as a catalyst for the creation of hypotheses to validate. The canvas is also available to download on Jeff’s website. This is a great tool for companies who are new to user experience and may be unsure of which direction to take. The canvas guides us through areas of the current business situation so we are able to identify areas that may need more clarification (e.g. there may be some sections we know less about - if so, let’s find out!) with the main output creating hypotheses for us to validate. How do you do one? 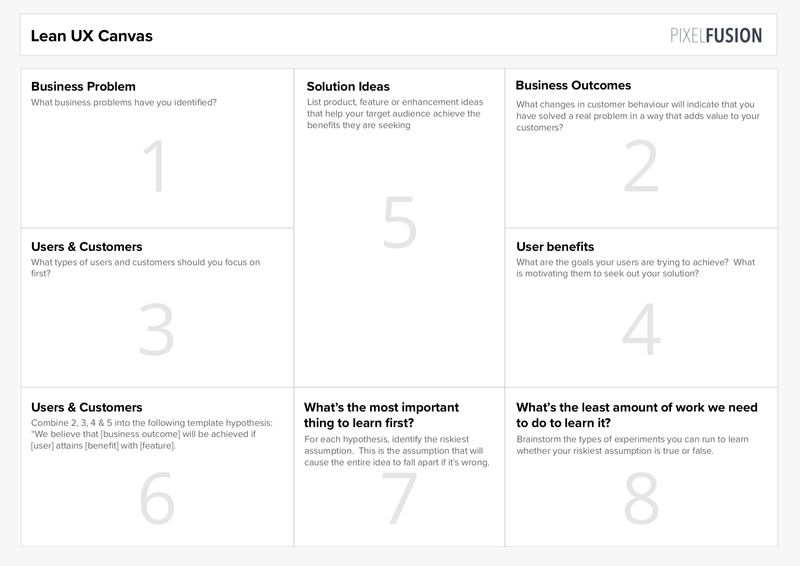 The process for completing a lean ux canvas is actually very easy to follow! Each topic is ordered by number from 1-8 and descriptions are provided so each section is easy to understand. What is important, is making sure the right members of the team are included - a mix of management and customer-focussed staff will help fill out both business needs, identifying customers and their needs. Once the canvas has been filled in we can get started on validating some of the assumptions we have. If a lot of solution ideas are dependent on a particular product or assumption, it’s important to go out and test this assumption. If it’s proven to be valuable, then those solution ideas can continue to be evolved, if not, remove them from your scope of work and carry on validating other ideas you might have. Our goal is to learn and validate our assumptions so that we have a clearer direction a product should take, removing risks and unusable or unwanted solutions as we go. In the end you should have a good understanding of what can and can’t (or shouldn’t) be done in order to continue building a solution that’s right for your business and your customers. Pixel Fusion is a one-stop-shop digital product studio, providing tailored user experience solutions to suit your needs. If you have a business diving into the digital space and would like assistance with customer research, visual design, building apps drop us a line to hello@pixelfusion.co.nz and let’s start chatting about your project or aspirations. Or sign up to our newsletter (it should pop up in the corner of this page by now) and we’ll send you information about our events – come and meet us at our studio bar called The Space Bar. We love hanging out there over a few drinks and we often chat through ideas there.